At Assentech we have a lot of experience with flame arresters and our MD has previously sat on the ISO committee. 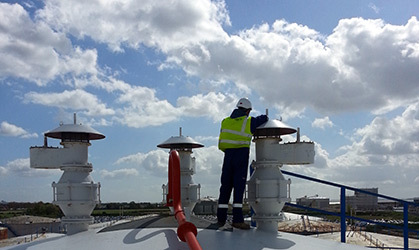 Our specialist software allows us to estimate your losses, calculate the flow rates your tanks require and size flame arresters accordingly – all of which is offered as part of the service. We understand flame paths and how flame arresters need to interact with other system components such as VRU’s, breather vents and flare stacks. We take a consultative approach to customers requirements and are happy to talk through your P&IDs with you. If you are concerned about the size or performance of your flame arresters we would love to talk to you. ATEX has had a big impact on flame arresters and we carry out free of charge site audits which help you know where you stand with respect to current legislation. If your system is not performing how you would expect then there is likely a problem – we will gladly carry out an inspection of your equipment and advise of what steps need to be taken to get better performance. As a Groth approved repair dealer we carry out inspections of flame arresters with respect to condition, function and compliance. We provide this service for all makes of equipment. 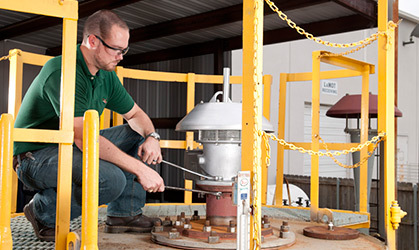 We install flame arresters and our engineers are fully insured to work on COMAH sites. We provide Risk Assessments and Method Statements in advance of all work as standard. We carry out off-site refurbishment of flame arresters at our purpose built service center in the South West – one of only 2 Groth Approved Repair Dealer workshops in Europe. We provide this service for all makes of equipment. We can tailor reactive and planned maintenance services to suit your needs as a customer and the specification of your equipment. Typically with flame arresters, we would recommend periodic visual inspections and cleaning, with scheduled replacement of internal components. Any equipment which requires further work can be fully refurbished at our premesis. We provide this service for all makes of equipment. If you or your team want to know more about flame arrester or get up to speed with EN ISO 16852:2010 we will be happy to run a technical seminar or lunch and learn session for you. We make no charge for the sessions for end users or groups of 5 or more people.